When we worked on FRIGŮL during the game jam, I didn't really have the time to look into our build system. I just had 5 minutes before the deadline and went for a quick Windows release build and be done with it. But it was important to us that the game could be played on as many platforms as possible, considering that being a gamepad only game would make it niche enough. So when working on the next updates after the jam, I went for a classic Windows, macOS and Linux builds, as well as WebGL so you can play directly from the store page. 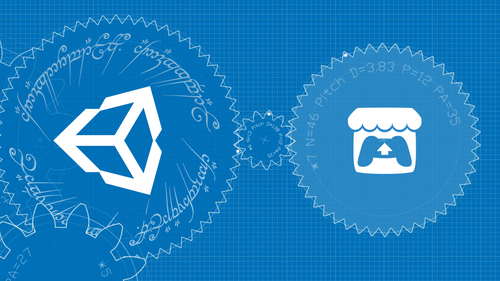 But switching between four platforms in Unity is cumbersome, especially with WebGL build time! Professionally, I'm used to have Jenkins do that work for me, but I wanted something simpler considering the scope of FRIGŮL. So I did what I usually always do, go on GitHub and look for an open source solution to my problem. And lo and behold, I found it in SuperUnityBuild! A powerful tool with a lot of customization by Chase Pettit. Which is also simple to work with if you need to modify it, as the code source is actually very easy to read. Although I admit that I had to modify the library a little, but hey that's what open source is for! First problem I encountered was the build size, it was enormous compared to my previous builds. Turned out that there's no compression method to select in SuperUnityBuild UI, so the data of the game was taking too much space (almost double the size). 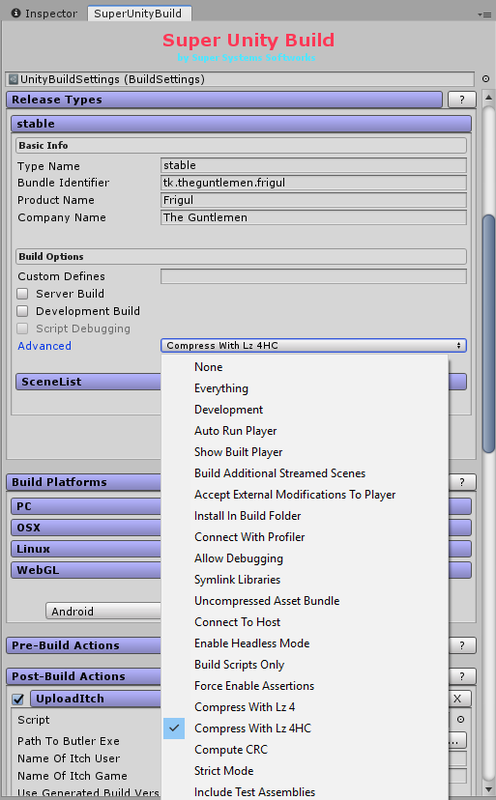 I forked the project and fixed that, I added in the UI an advanced option allowing you to select all the Unity BuildOptions you want, including the compression method. Another issue I had was that WebGL upload to itch.io wasn't supported, and the way the channel name was generated didn't fit the format I picked initially. Forked the actions project as well, and added these too. Next step is setting up a GitLab runner and a Unity Docker image, so that the build is done automatically when I push new release tag to the git repository. Will you also be posting a devlog about the Gitlab runner and Unity Docker image when you're done with it?